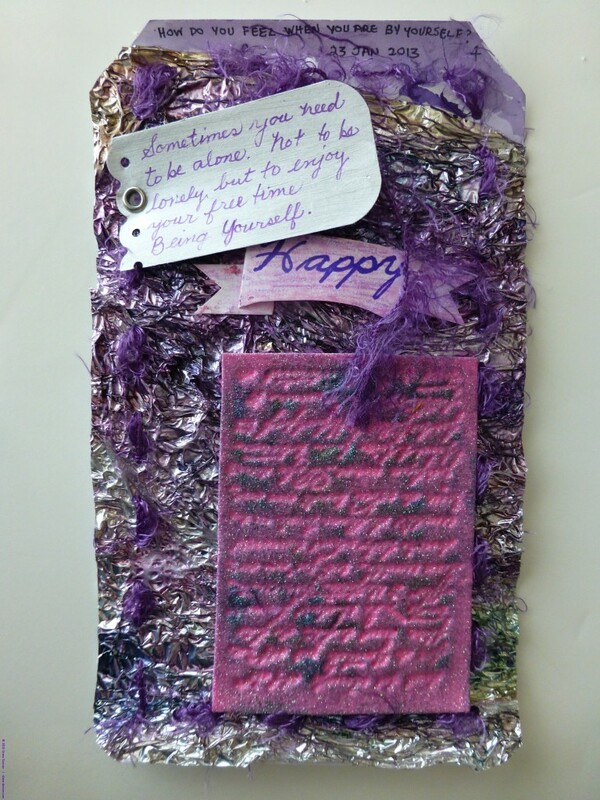 This is week 4 of a weekly art journal based on guides provided by Dale Anne Potter. All pages of this art journal are based on a tag created from card stock. This weeks challenge was How do you feel when you are by yourself? For the background this week, I experimented with ‘bubbling’ an empty cracker bag. Some bubble well but others don’t and I found that this one took a long time to respond to heat. I eventually remove any protective layer and directed my heat gun directly on the bag and this is what I got. My watercolours were out so they were used to tint the surface but I needed to apply fixative to prevent the colour from rubbing off. After using a punch to make equally spaced holes around the edge it was ‘stitched’ to the tag with furry yarn. The embossed ‘message’, 3-D ribbon message and rivited tag were then attached. This is one of my favorites so far. My response was ‘happy’. I think the saying (found on Facebook without credit given) sums it up for me. “Sometimes you need to be alone. Not to be lonely but to enjoy your free time being yourself”.